While most knitters are dedicated to hand knitting, machine knitting is a great way to become fast efficient, and accurate in your work. The knitting hobbyist may not find much of a use for a knitting machine, but if you knit in order to make money, or make garments for your family, you may want to consider this purchase. Many large manufacturers use machines for knit fabrics, but you can also find knitting machines intended for household use. Not only will you be able to easily figure out the ins and outs of using your machine at home, but also you’ll be able to quickly create knitted goods without working day and night on each project. Many hand knitters despise the idea of machine knitting, and consider it to be cheating. All you should know on this topic is that once you have tried it, you will know that it is not cheating! Learning the ins and outs of a knitting machine can be a lot of work, and converting your knowledge of hand knitting to machine knitting can be extremely complicated. Still, once the initial learning hurdle is passed, you’ll find that there are many benefits to knitting on a machine. The most obvious benefit to knitting with a machine is the speed at which you can finish each project. Using a machine to knit sweaters, scarves, or other goods for your family will speed up the process immensely, meaning less money spent in department stores on over-priced winter garments. This of course can also be a most useful factor to consider if you are looking at starting a knitting business or if you want to make money knitting. Not only will a knitting machine increase your efficiency, but since most machines use programmed patterns, the ACCURACY will be high as well. While knitting by hand can produce slipped stitches or a crooked cable when you aren’t paying enough attention, a machine is made to accurately complete a job and is less likely to result in noticeable mistakes in your knit fabric. If you’re considering making the switch from hand knitting to knitting on a machine, there are a few differences you should first become aware of. First of all, not all stitches can be created the same way on a knitting machine, and some can’t be re-created at all, or are just too tedious to be worth it. Another big difference in knitting with a machine is the gauge. Since knitting machines feature needles that are locked in place, you can’t just change their position or size to meet a different gauge. Instead, you have to create several gauge swatches before you can even consider knitting something sized on your machine. To find the proper gauge on a machine-knit gauge swatch, you have to first take it off the machine, roll it up, tug on it from top to bottom, and then let it set overnight to get an accurate size. 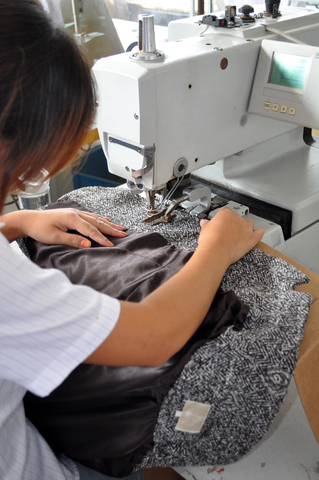 With a knitting machine, there is a lot more work in the preparation, but once you have gotten accustomed to your machine and how it works, the overall production will be much faster. The most important aspect of choosing a knitting machine is to know what size yarn you prefer. Since the needles are locked into place, you can’t change them out with larger sizes for different yarns. It doesn’t really matter what projects you want to use your machine for, or what types of fiber you like best. Consider going into your local yarn store and saying “I want needles that knit wool.” That doesn’t make much sense, does it? It’s the same concept for a knitting machine. Rather than knowing what type of fiber you like, you need to know what size you like, so that you can choose a machine equipped to handle your yarn. Making the switch from hand knitting to a knitting machine can take a bit of time. However, if you are looking at selling knitting or you’ve decided you need to become much more efficient for one reason or another, it can be worth the time needed to make the switch. If you find yourself wanting to produce your knitting faster than your hands can move, then you should be considering machine knitting as your newest hobby. Many machine knitting enthusiasts have turned their favorite pastime into a profitable business. If you have a passion for knitting and have lots of downtime, a knitting machine can help you jump-start your home knitting business and begin making money from your masterpieces. A great way to start is by machine knitting little items such as socks, bonnets, mittens and scarves. Family members, friends, and the local community can help you build a stable customer base. As your knitting business grows, you can move on to more challenging pieces such as sweaters, cardigans, tea cozy sets, shawls, vests, throws, and afghans. As with any other sales venture, pricing is crucial to a home knitting business. If knitting for money is your goal, treat your creations as works of art rather than clothes sold off the mill. Make sure the price of your machine-knitted garments reflect the true value of your skill and effort. If you charge too little you’ll end up losing money. If you charge too much, you won’t attract as many customers. Balance your expenses and pricing to produce a healthy profit. Costing involves two factors: time and materials. 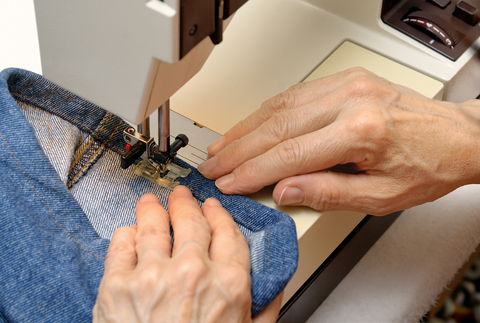 Calculate the amount of machine knitting time you will spend on the creation of a piece. The price of your socks should be different from the price of your afghan line because of the obvious disparity in knitting time needed. Set an hourly rate for your work based on the minimum wage in your country. Your hourly rate should never be lower than $7.25 in the US, and £5.73 in the UK. Knitting machine yarn will make up the bulk of your material expenses. Always count knitting yarn as a whole, even though you’re only using 75% of the batch. This way your yarn cost is completely covered whether you use the remaining 25% or not. Other expenses you may incur in your home knitting business include trimmings, fastenings, linings, labels, packing materials and shipping. Don’t worry about pricing your homemade machine knitted pieces higher that those sold online or in shopping malls. Although you’re using a knitting machine, each garment you knit is crafted especially for your customer and not mass-produced for the general public. With a knitting machine, you make money and save money. Machine knitting socks, mitts, scarves, hats and sweaters for you and your family can save you hundreds of dollars in wardrobe expenses. Your machine knitting skills should also come in handy during special occasions such as Christmas and birthdays that call for personalized gifts. There are also some great resources online where you can learn more about how to make money knitting. I would strongly recommend you visit Liz Raad’s blog www.knittingforprofit.com/blog for lots of great free information on how you can make money from knitting. She has also written an extensive E-Book on the topic of making money from knitting and you can get all the details plus order a copy for yourself by visiting: www.knittingforprofit.com. Machine knitting fans are ecstatic about how fast their equipment can produce elaborate stitches. But even with speed and volume advantages, machine knitting can’t absolutely replace hand knitting. They are two totally different crafts and, often, you will need to do a combination of hand knitting, machine knitting and crochet trim to finish a project. With a knitting machine, you can weave large pieces with knitting machine yarn in a short amount of time without inflicting your hand with carpal tunnel syndrome. Machine knitting brings out your creative side – blending delicate lace with fancy patterns in exotic color mixes that might otherwise be tough to achieve when knitting by hand. Machine knitting also provides you with hundreds of patterns to choose from, pre-installed with your equipment so you don’t have to browse through several shelves in a crafts shop. 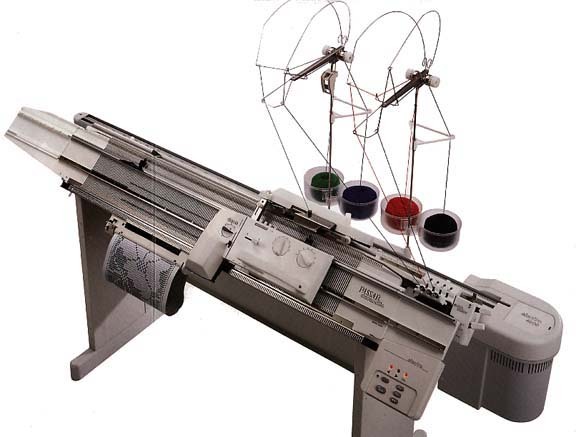 A Brother knitting machine has more than 500 pre-set pattern options. Despite these benefits, there is a downside to machine knitting. And it’s important to know about these disadvantages before you fork over all that cash on a knitting machine. First of all, knitting machines are way too bulky to sit on your lap. They would take up a large amount of space in your house. Also, knitting machines require tons of spare time when setting up and learning their complicated features. Knitting machines can mean a large investment of money. Brother knitting machines can cost around $500 or more, depending on how fancy the features are. A knitting machine works with only one weight class, so you will need a different knitting machine for each different yarn weight you will use, plus expensive special attachments for ribbing or working knit/purl mixes. A Silver Reed ribbing attachment goes for around $700, an Intarsia carriage for $90, and yarn changer for $300 – these are all added costs that could drive your costs through the roof. Flexibility is one advantage that hand knitting has over machine knitting. You can increase or decrease as many stitches as you want in the middle of a row just as easily as the beginning or the end. But to do ribbing or purl stitches on a knitting machine, you have got to drop all of the stitches on the row that you need purled and work them back up again. You can see both sides of the pattern while you are hand knitting, but you can only see the purl side when you’re machine knitting, making it difficult to see how the final result would actually look like. If you are still set on buying a knitting machine, try out several brands and models as you begin your search. Ask other machine knitters for recommendations or attend knitting seminars. Machine knitting chat groups online are also great sources of info when deciding on the appropriate knitting machine for you. Knitting socks is a great hobby and it can also be a profitable side business for stay-at-home moms who have been practicing the craft for years. If you want to make money from knitting socks, mittens, or scarves, you will need a sock knitting machine. Finding one can be a challenge because the sock knitting machine is obsolete. No one makes them anymore so you will have to look for a restored machine through antique dealers or a used furniture store. When buying a sock knitting machine, make sure it was thoroughly cleaned, polished, adjusted, timed and knitted on. Now that you have a sock knitting machine sitting in front of you, learn first how to knit tubes, then heels and toes, using practice knitting machine yarn. Sock weight knitting yarn is ideal, but you can also use sport and worsted. Opal, Regia, Loma’s Laces, Trekking XXL, Fortissima and Alpaca are some of the popular types you can apply. Loose the tension when working with thicker knitting yarns. In the sock knitting machine is a cylinder with slots for needles. Latches on these needles do the knitting as each needle passes through the cam shell path. To make socks on a knitting machine, set up a bonnet or webbing on the middle of the machine to make the needle move continuously. Thread some brightly colored scrap yarn and knit about two to three inches. Later on when your sock is done, you can clip and rip this scrap yarn from the hem of your sock. Set the yarn firmly on the yarn ball winder to maintain an even tension. Turn the crank and count the number of rows made as the carrier goes around the cylinder. Take a stitch from the first row and hang it on the needle to knit the hem top. Once the hem stitches of your machine knitted sock are done, you can put a ribber on the machine to produce purl stitches. With the ribber on, crank the machine to the desired length of the leg part of your sock. As you knit the ankle part of the sock, half of the stitches on the ribber needle will transfer to the cylinder needle. Note the red marks on the cylinder as your start and stop points for the heel and toes. To knit the heel, raise the back half of the needles so you only work on the front of the machine. Raise a needle on one side and crank around. Raise the other side and knit back. Repeat this process until you reach the red mark. After the heel is knitted, move on to the foot of the sock. The toes are also knitted on the front half of the knitting machine, just like you did with the heels. Sew up the top of the toe with a Kitchener stitch and you’re done. Learning the intricacies of a sock knitting machine takes patience and a lot of practice. But once you get the hang of it, you’ll enjoy your hobby more than you ever did. Hand knitting is a craft that is enjoyed by many people, but if you’re way past the novice level and want to take on the challenge of knitting larger patterns, or your knitting business is at the stage where you can’t keep up with demand by hand knitting alone, or you just want to be able to knit up more items per hour, then maybe it’s time for you to invest in a knitting machine. 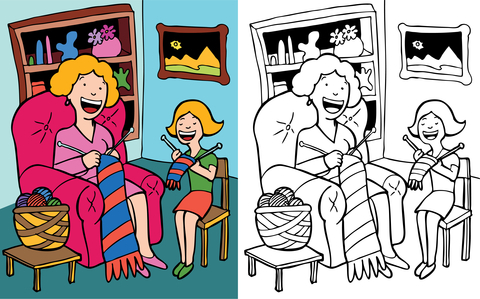 When you knit by hand, you create one stitch using two needles. Imagine how much work you can do with a knitting machine that constructs an entire row all at once! There are three common types of knitting machines: bulky machines, standard beds, and mid-gauge versions. Some are simple looms while some can be highly complex with buttons and dials operating computerized functions. Heavy sweaters are knitted on a bulky machine, which has needles set 9mm apart and hook and latches that are large enough to work on thick yarns. Bulky machines can also carry out Fair Isle, tuck, slip, lace, intarsia, and other knitting techniques. Studio, Brother knitting machines, and Silver Reed are popular brands of chunky machines. These knitting machines can be mechanical knitting machines, which allow you to choose from selection of pre-punched cards as well as create your own patterns. Electronic knitting machines have more flexibility and a wider range of uses. They can have around 300 patterns stored in memory which you can turn upside down, mirror, reverse, or double the width or length. Standard knitting machine beds are typically used to knit suits and lace curtains. Needles are placed 4.5mm apart and the hook and latches are smaller than those on bulky or mid-gauge machines. A standard bed knitting machine usually offers numerous stitch type options and can accommodate very thin yarns. 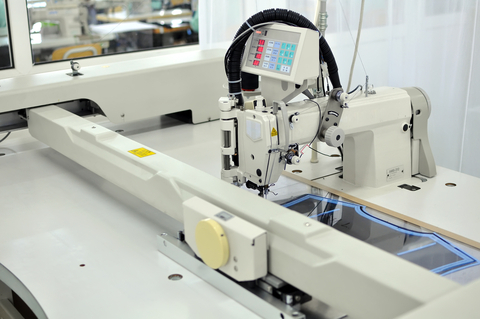 Electronic standard bed knitting machines allow you to choose from more than 650 templates with more room for customized patterns. Advanced models like the Brother KH970 come with an automatic lace carriage and a computer program that enables you to knit the same sweater with different yarns, gauges and stitch design without re-entering the garment piece. Mid-gauge knitting machines produce the closest quality to hand-knitted fabrics. With needles set 6.5mm apart, these machines can knit a wide variety of yarns, including baby, sport and worsted types. Lace is done by hand and most models do not have stored patterns or automatic selection of needles. Mid-gauge machines can do some of the most common knitting stitches like stockinet, slip and tuck, as well as techniques involving weaving, plating and ribbing. When choosing a knitting machine, decide on what type of yarn you want to use, what features you need, and how much you’re willing to spend. A row counter, ribber, and tension mast are necessities in a knitting machine. Some special features you may want to consider are lace carriages, garter bars, punch cards, automatic color changers, and intarsia carriages. It is best to get a knitting machine with these extended features so that as you get more confident with machine knitting, your machine will be able to grow with you and allow you to take on more challenging projects.